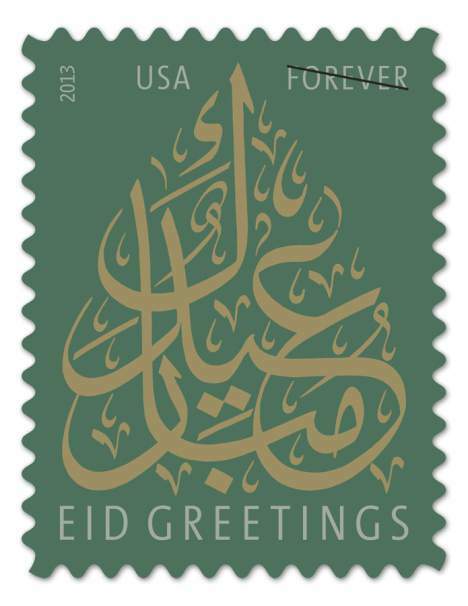 In 2013 former President Obama directed the United States Postal Service to REMEMBER and HONOR the EID MUSLIM holiday season with a new commemorative 46-Cent Forever First Class Holiday Postage Stamp. There is nothing wrong with the stamp. Most Americans are simply spitting on the wrong side of the stamp. 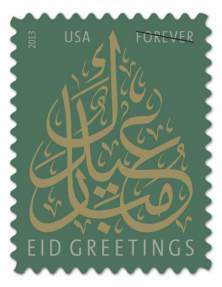 Sadly our Postal Service does not realize that in Muslim countries it is forbidden for non-Muslims to issue stamps in Arabic; see How the West Will be Won - item#7 among the list of prohibitions for infidels living under Muslim oppression protection. We should note that this useless, moronic gesture by Obama and the USPS to show respect for Muslims did not prevent any attacks or planned attacks since 2013 by devout Muslims who do not respect our laws or our Constitution because Islam forbids them from doing so. P.S. The stamp mentioned in this article comes with an adhesive so licking the stamp is not required, however that should not prevent anyone from spitting on it anyway. This article was inspired by an Internet email sent to me by reader J.H.